Downtown Fairfax. By Ryan, on Flickr. 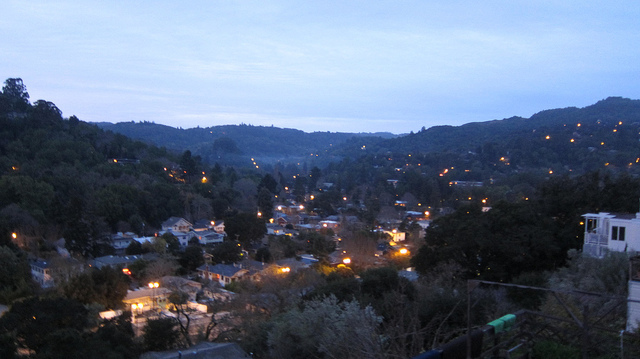 Coalition for a Livable Marin has launched a petition asking the council to stop the process of rescinding the zoning. The coalition’s steering committee, of which I am a member, believes the decision to rescind the zoning is bad for the town. Not only does it spit in the face of downtown, essentially saying it’s an aberration that shouldn’t be replicated, but it puts in jeopardy 71 affordable housing units. David, can you educate us on how ordinance 778 promotes affordable housing. From a quick read of the ordinance, I don’t see anything in there mentioning affordability. It underpins the Housing Element. Without 778, the Element doesn’t do anything and is invalid. As well, the county’s grant to the Lutheran Church is dependent upon the projecting being legal. Without 778, it is not. I just read a bit more on this. It looks like the original ordinance forgot to mention 98 units of housing on a 4th parcel (when only 3 were included for approval). With the level of trust in government today, I think I see why it was so easy for 1,000 signatures to be collected here. It seems like the Fairfax planners need to be more careful when they are working on issues of development. At least here there is some reason to push through the development (ABAG allocation). People in central Marin have lost faith in the progressive development agenda after the LSAP process. I live next to Lutheran church development. It’s the right idea in wrong place. Current design doesn’t fit into Fairfax I think it’s a development design that looks like it belongs in Santana row in San Jose. Not Fairfax. And the transit is very bad out here and to désignate a development as transit oriented when essentially there is sparse transit is not being honest. Until I see all these proponents of development riding the buses around Marin to do their errands and work I don’t think anyone should be calling any development in Fairfax transit oriented.